Hi there! Good to meet you. Welcome to Grapevine. We are an inclusive, mission church called to look outward, not inward. We hope you like our informal, fun style and passion for the gospel message. We care about people and have place ready for you. Grapevine Community Church is a family bound together by the love and grace we have received in Jesus. It’s a place where we aspire to support and encourage one another, somewhere you can truly meet God. Church should be the greatest, most exciting community on earth, so why not come along and join in, just as you are? We love being together, Grapevine may be the church for you. The beauty of church is that it is made up of people who have had their lives turned around after meeting Jesus. Everyone has their own personal faith story which can speak into the lives of others. So, maybe this is the time for you to stop running from God and allow Jesus to give you hope and a new direction? Jesus is radical, amazing and life changing – he gives us all a new life story, if we let him. Grapevine grew from a small volunteer house church in 1995 in response to prayer and prophecy. We are based in Illogan, between Redruth and Camborne. Our dream is to be a church where people can be themselves, working together, demonstrating the love of Jesus in action. We want to be a generous, prayerful church which reaches out both locally and globally and encourages people to get involved and develop their own ministries. Jesus radically changes hearts; he brings new hope and gives us a new life perspective – we are committed to this message and sharing the impact Jesus has had on our lives with everyone we know. We are a community who have met Jesus in a life-changing way. Being a community means looking after one another. The focus of the church is To love God, to love each other, to love others enough to tell what Jesus has done. Everyone deserves a second chance and so our vision is to show people the love of Christ and encourage them to become his, so they in turn can then minister others – in other words, all of us can have a New start, new love, new life. We have an informal, friendly approach in all our ministries with the aim of freely sharing the gospel message and focusing on disciple-making. Everyone is encouraged to use their God given gifts as part of our outreach and to participate as much as they can. We try to teach and preach in relevant ways concentrating on the personal practical application as revealed in Scripture. This is a family friendly church. It’s inspiring to see such a wide range of ages taking part in worship and just how everyone gets along. We want our children to feel safe, secure, valued and part of church. We strive to provide the best social, emotional and spiritual environment for them. There are plenty of activities to join in. The church offers a range of ministries for children, youth, and adults including Bible study and discussion, prayer and pastoral support. God must always come first and all that we do should be in response to our love for Him. The sharing and working out of faith is based on love and a servant’s heart, honouring one another, putting others first, and serving the Lord. Basically, it is not about what we can get out of it, but rather what we can give. In this modern world this is somewhat radical – putting others first, abandoning our own plans, and not looking for something in return. We hope that Grapevine demonstrates this in action, is an oasis in the desert, a place to rest and recuperate. So if you’re not feeling okay, then it’s okay. Nobody can go through life without needing help some time in testing circumstances, dealing with emotions, or just relationships with people. In these circumstances the simple act of drawing alongside someone can be most helpful. This is part of church as well. I feel so free and can truly be myself – I love this place. I love being here surrounded by people who care. God has brought me into a new way of life – with peace in the midst of everyday storms. When I went through very dark times Jesus walked beside me and held my arm. Church is my extended family, my brothers and sisters, somewhere we can all be ourselves, encouraged and loved. Thanks for dropping by, a warm welcome from us and everyone at Grapevine. We have a great team here who love to encourage and bless. For us, it’s a privilege to be part of this church, watching people strengthen their faith, use their gifts, grow in confidence and realise the fact that they are loved by God – just as they are – here and now! We all deserve a second chance, a place to recuperate and somewhere we can be ourselves and develop our God given potential. We are not perfect, but we love God. Interested? We’d love to meet you. 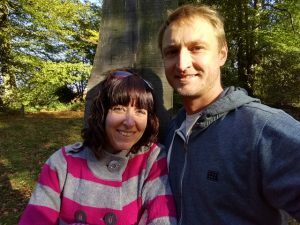 Alan and Nic have been members of Grapevine since 2001 and are passionate about being involved in the local community and serving God through leading home and youth groups, running marriage courses and being part of the church leadership team. 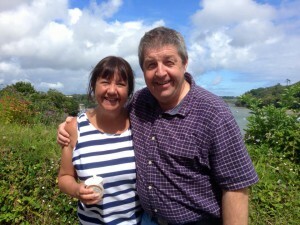 Both work in the local community, Alan is a full time Software Developer and Nic works part time as a Speech and Language Therapist at Camborne and Redruth Community Hospital. They have three children and a dog called Rosie. 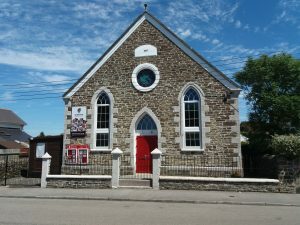 Grapevine Community Church is on Broad Lane at the junction with Spar Lane, Illogan, Cornwall – TR15 3HY. This is what the church looks like – you can’t miss the red doors!